Simple, yet poetically beautiful. This was the phrase that occurred to me after I finished reading the book of poems titled ‘An Affair with Love, Life & Gratitude’ by Sushmita Kalashikar. As soon as I read the first poem I was thrilled by the fact that the poet believed in adorning her verses with rhyming words. This simple but effective means of writing beautiful poetry has fallen out of fashion as far as I can judge from the recent books on poetry I have read. I immediately took a brief look at some of the other poems in the book and I was thrilled to note that Sushmita has used rhyming words in every verse of every poem in her book. I was really happy that after a long time I was reading poetry to my liking. I began reading the poems one by one. 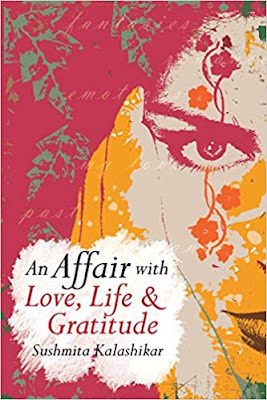 The book is divided into poems on three major aspects of human sustenance Love, Life and Gratitude. The poems in the section love are a celebration of the mellifluous emotion of love between men and women. In this section, there are poems describing the warmth and depth of feeling between spouses, how one’s spouse can be a source of strength and inspiration and several other such poems. At the same time, Sushmita has not confined herself to love as a positive emotion alone. She has also dealt with how love can deteriorate into hate and abuse. I quote two poems from this section with a verse from each that really struck a chord in me. And for choosing a path against the love manual. The truth is within each other our heart and soul lies. The next section containing a much larger number of poems is life. This section has poems that deal with racism, sweet memories of college days, the necessity to speak out, the beautiful oncoming of monsoon after a scorching summer and all aspects of life that we as human beings celebrate. I give below two poems I liked best with a verse from each. Let all colors in the cup of life brew. The final section is the one on gratitude and this too has a smaller number of poems. This section includes poems on gratitude that one feels for one’s parents and other people who play an important role in a person's life. Here are my two samples with verses that I really loved. Now, there is one particular poem in this book which left a very deep impression on me. I am just going to post a couple of verses from this poem here because they are simply fantastic, and it would be remiss of me if I do not mention these verses in my review. I am not going to tell you which poem they come from because I don't want to spoil your fun. The description and analogies in these verses are simply par excellence. Here it is. And the clouds like clutters of dough. Like the demons of night they prowled. Do I have any criticism? Well, this is not a book of literary poetry. The language is simple, and anyone can read, understand and enjoy these poems immensely from a 7th-grade child like my daughter to her 52-year-old father like me. The poems except a few do not carry implicit meanings. By that I mean you don’t have to read between the lines to understand the import of the verses. They are simple straightforward poems written beautifully and are vintage old school poetry. Personally, I am not a literary high-brow type and prefer simplicity. But if you are the kind of person who likes deep hidden inner meanings conveyed implicitly by a clever play of words and analogy you are not going to find that in these poems. Taking that into consideration I give my rating below.